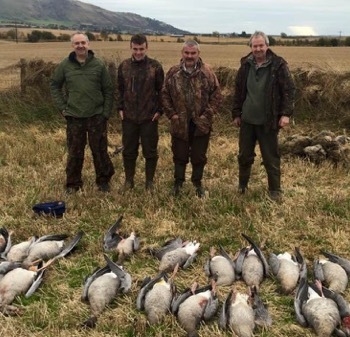 All your goose shooting will be conducted over farmland which is used solely by PigeonAllDayLong and is some of the best goose feeding areas in Scotland. Your shooting will be carried out from daybreak and will continue until a good flight has occurred, with a time limit around 10 a.m. on the not so good days. We shoot Monday to Saturday. The main quarry will be Pinkfoot & Greylag geese with the occasional Canada goose. 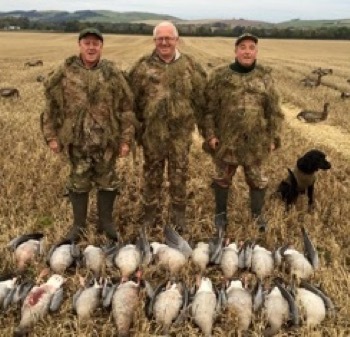 Your guide will expertly position the decoys and advise on the best hide layout, you may be along a wall hide, against a hedge or in a layout blind depending on the situation and conditions. Your guide will give you a safety talk at the start of the flight and run through everything that will be expected to happen. Your guide is in full command while you are shooting with us, his word is final. If anyone continues to disrespect the guides wishes then they will be asked to leave the field. 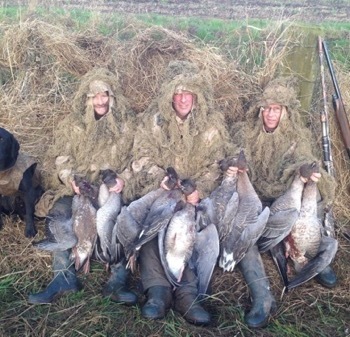 We have a bag limit as advised by BASC which your guide will remind you of. Our aim at PigeonAllDayLong is for you to enjoy the whole experience of wild geese on your morning flight!! !